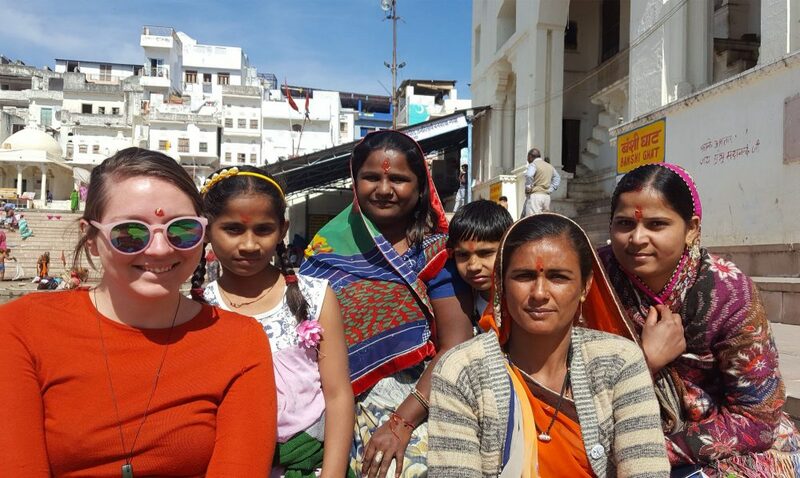 BLOG: Touring India - where are the local women? Touring India: where are the local women? In 2016 the tourism and hospitality industry was worth US$47 billion to India, and is predicted to rise to US$160 billion by 2026. So when I had the privilege of touring through India last month, I was just one of thousands who visit each day. I was in the beautiful, rhythmic countries of both India and Nepal to attend a wedding, a cultural amalgam of Nepalese and Indian traditions. It was as you’d imagine: bright, contrasting colours, fairy lights streaming down walls, old and beautiful halls hosting hundreds of smiling, excited people. It was new even to the locals, in that two distinct marriage rituals were being sewn together. When I travel through developing countries I try to focus on the resilience and strength of the people I see, rather than their poverty. I do this by looking for clues on how the society functions – the motorbikes slowing down for pedestrians, local people shopping and eating together, business people donating small change to beggars. This time, it wasn’t the poverty that I found most confronting. At some point during my wanderings around rural India I realised I hadn’t spoken to a woman for days. The women could be seen as smudges against the landscape through the bus window in their vibrant saris that put Melbourne’s standard black to shame. But the only rural women I interacted with were the women begging on the streets, often with young babies. And my time in the cities wasn’t much different. Women were much more visible working in retail positions, with their families and husbands, and sometimes in cleaning roles. But they weren’t the ones receiving large tips from wealthy (or confused) travellers. They weren’t the ones negotiating (comparatively) generous sums of rupees for rickshaw rides. Most often, they were the ones in the corner – just quiet, gentle presences. In an article published in the Indian Journal of Applied Research in 2013, Professor G. Sandhya Rani explains what I was seeing with clarity: gender segregation of the labour market is observed in the tourism industry as women are pushed into service roles, and away from decision-making roles, with fewer career development opportunities. These roles include housekeepers, babysitters, launderers, dry-cleaners, factory workers and the like. Women indirectly benefit from tourism, but have little control over their working conditions, wages, or indeed jobs. Last week, back on Australian shores, I read with interest the significant media coverage of International Women’s Day. I watched my social media feeds as women – and some men – from all walks of Australian life publicly demonstrated their support for tackling the gender imbalance we still find in our boardrooms, or the symbolic impact of introducing female icons into our pedestrian signs to challenge unconscious bias. Feeling lucky to live in a society that is able to have these discussions, my thoughts went back to the short time I spent with this group of quiet and gentle women in the Indian town of Pushkar pictured above, and the continued drive through the United Nation’s Sustainable Development Goal #5 to achieve gender equality and empower all women and girls. While my investment in saris and trinkets surely made an economic contribution to these burgeoning nations, did my visit do anything to address the gender imbalance that still plagues much of our world? While it was lovely for me to share in their lives for a brief moment, I wonder did it benefit them at all? At Currie, I work with a group of people who believe every business can make a positive contribution to building a better world. And it makes me feel lucky to be here. While I recognise there’s still gender imbalance in my society, as a woman I can do so much more than if I had been destined to a life in rural India. And for that I am grateful. Eleanor graduated from Monash University with a BA(Honours), a Diploma in Environmental Sciences and a Masters in Politics. Her studies began with Shakespeare and climate change - an odd combination, but she found both came in handy when she developed an app explaining correct ways to recycle. Eleanor is interested in commandeering digital technologies and using the power of business for good.